There I stood with the Columbia Valley stretched out nearly 6000 feet below me, the top of Mt. Swansea was nothing short of spectacular. Waiting for the wind to get just right, I took the time to enjoy the panoramic views that lay in front of me. To the west, the Purcell Mountains and to the east, the Rocky Mountains with beautiful Lake Windermere below me. My heart was pounding so hard I could feel it in my Brent DuBois in flight. ears knowing that within moments, I would literally be running off of the mountain and into thin air to fly amongst the clouds on a tandem paraglide with world class pilot Max Fanderl. Growing up, you always hear your parents warn you about the company you keep as you often times end up doing things that they enjoy doing. The company that I keep tends to be on the daredevil adventurous and slightly crazy side. I am not sure what that says about me but the old saying is birds of a feather flock together. Tanya DuBoise getting ready to fly.Brent and Tanya DuBois from A/Z Outfitters have been paragliding for nearly a year and when Brent and I had a break in our spring bear hunt schedule, I couldn’t resist the invitation to go flying for the day. Especially with a world class pilot in one of my favorite places on earth, beautiful British Columbia. I felt at ease having watched both Brent and Tanya run off of Mt. Swansea earlier that morning making a safe flight and landing into the valley below. Knowing that Max was behind me gave me great comfort even though I was scared to death and Max knew it. Okay, I was more scared to bungee jump in New Zealand than I was to run off this mountain but scared is scared and running or jumping off a cliff has the same psychological association. When the wind got right Max gave me the word to start running and to not stop running until he tapped my shoulder. We literally ran off the side of Mt. Swansea, until my feet no longer struck the ground, instead they blew in the wind. The thermal activity was strong and as soon as our wing took flight, we were grabbed by the air and pulled high into the sky. It literally felt like being sucked up a vacuum hose. I couldn’t stop giggling, the sensation was exhilarating, like nothing I had ever before experienced. The giggles were probably more out of nerves than anything but they were unavoidable, so I giggled more. Max is an expert pilot, literally one of the best in the world. He has been on Team Red Bull X-Alps Adventure Race three times which is the world’s toughest adventure race. 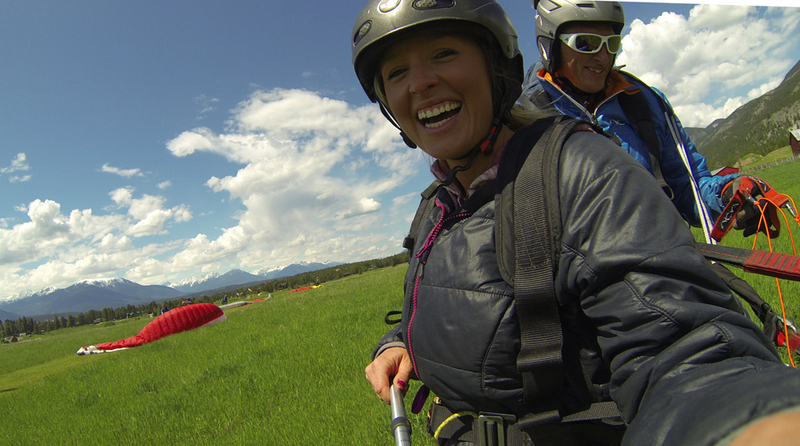 Racing through the Alps by foot or paraglide, a straight line distance of 1,000km. 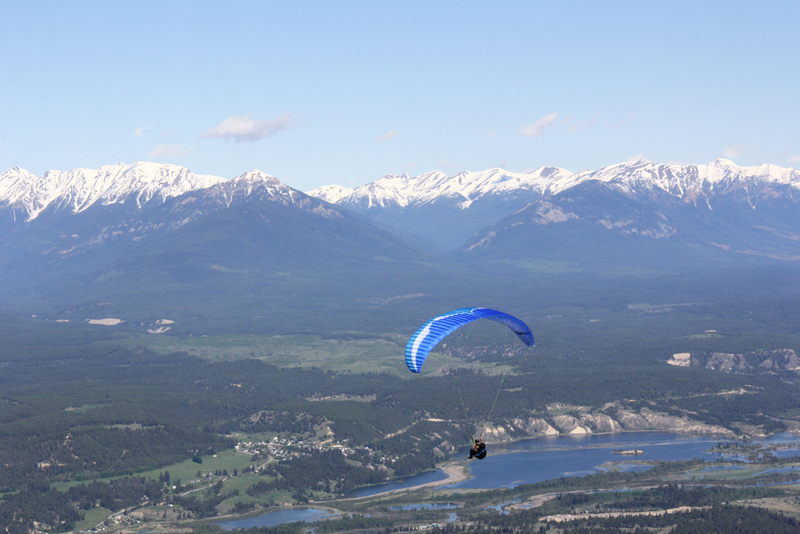 To compete you must be an expert paraglider and excellent endurance athlete covering over 900 km by foot by race end. Once I was settled in and my giggling had stopped Max demonstrated some “tight turns” with the paraglide that was reminiscent of a wine cork screw. Spin, spin, spin. We flew through the air sideways round and round and round. The G-Forces pulling at us tight, my giggles resumed. At one point, I thought I might get sick but I stuck it out like a champ. This flight was not for the faint of heart, this flight was for the adventurer the person that wants to live every moment to the fullest, this flight was for me and I loved it! Back on the ground, it took me a couple of hours to come down from the rush of adrenaline that I had experienced in the air with Max. I am already looking forward to my next trip to fly beautiful British Columbia with Max, Brent and Tanya.